China and Russia vetoed a Security Council resolution that would have referred the situation in Syria to the International Criminal Court (ICC). 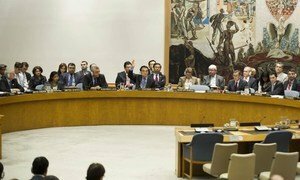 Despite repeated appeals by senior United Nations officials for accountability for crimes being committed in Syria, the Security Council was unable today to adopt a resolution that would have referred the situation in the war-torn nation to the International Criminal Court (ICC), due to vetoes by permanent members Russia and China. The resolution, which was backed by the other 13 members of the Council, would have given the Court the mandate to investigate the horrific crimes committed during the course of the conflict in Syria, which since March 2011 has witnessed the deaths of over 100,000 civilians, the displacement of millions and widespread violations of human rights. “The Syrian people have a fundamental right to justice. The United Nations and its Member States have a fundamental duty to defend that right,” Deputy Secretary-General Jan Eliasson said in remarks delivered on behalf of Secretary-General Ban Ki-moon prior to the vote. “Since the outbreak of the war in Syria, I have persistently called for accountability for perpetrators of grave human rights violations, crimes against humanity and war crimes. The recent attacks against humanitarian convoys and personnel, which may constitute war crimes, add to the urgent need to see action now on accountability in Syria,” he stated. In February 2013, the UN-appointed Commission of Inquiry concluded that the ICC is the appropriate venue to pursue the fight against impunity in Syria. “If members of the Council continue to be unable to agree on a measure that could provide some accountability for the ongoing crimes, the credibility of this body and of the entire Organization will continue to suffer,” Mr. Eliasson warned. Today’s action comes less than 10 days after the Joint UN-League of Arab States Special Representative on the Syria crisis, Lakhdar Brahimi, resigned from his post after nearly two years of diplomatic efforts to bring about a political solution to the brutal civil war. Despite the appeals for united and concerted action to help end the escalating violence in Syria, the Security Council today failed to adopt a resolution that would have threatened sanctions on Damascus, owing to the negative votes of permanent members Russia and China.